Web Classification provides the most effective way to block access to unwanted content and protect users against web-based threats. Web Reputation secures users against URL risks, regardless of category. Publishes dynamic intelligence of high-risk IP addresses and insight into inbound and outbound communications. Catches advanced phishing attacks by providing time-of-need protection through real-time scans before sites are visited. Stops malicious files in transit before they infiltrate your customers’ networks without requiring a complete file download. Provides dynamic file reputation intelligence of known malicious and whitelisted files to stop the distribution of malware. Provides industry-leading protection against mobile threats through antivirus, antimalware, and secure web browsing. 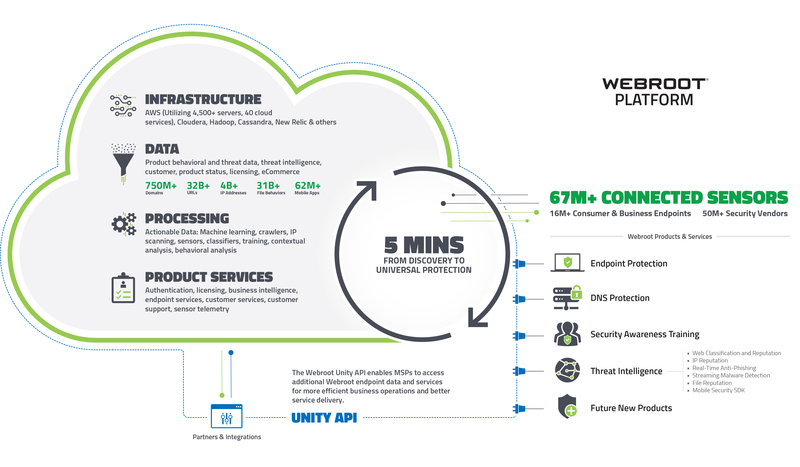 The Webroot Platform is an advanced cloud-based security architecture. Inputs are provided through millions of threat sensors deployed globally, at which time 6th generation machine learning and behavioral analysis are automatically conducted in the cloud in real time. A contextual analysis engine is also used to correlate previously disparate data points, providing dynamic intelligence that is always up to date, highly accurate, contextual, and actionable. Insights, analysis, and information on how collective threat intelligence can protect organizations from sophisticated attacks.. Protect your customers from a new breed of online threats with a new, three-dimensional approach that provides next generation threat intelligence. News about threats can't wait. In our quarterly threat trends updates, we give a by-the-numbers account of Webroot's insights into the latest threat issues.